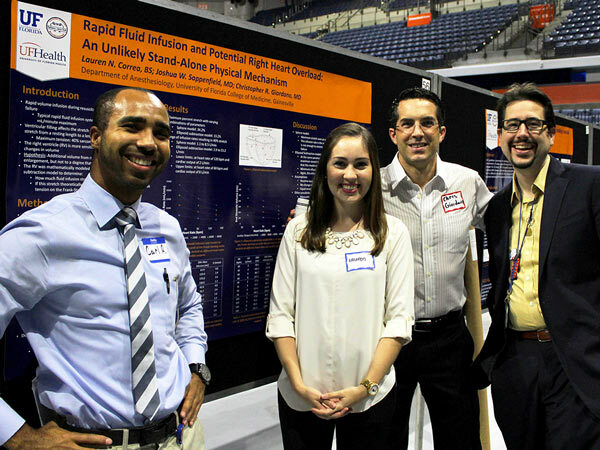 Welcome to the Anesthesiology Residency and Fellowship Programs at the University of Florida. We invite you to explore our training opportunities and to learn more about what we have to offer. The field of anesthesia is changing due to the complexity of the cases seen, the technologies available for patient care, and the clinical models that we apply. There are also new demands placed upon practitioners due to the skills necessary for clinical and biomedical research exceeding those needed just a decade ago. As such, current models of anesthesiology residency training need new directions to meet the needs of society. Working within the guidelines mandated by the Accreditation Council of Graduate Medical Education (ACGME), we proudly announce new opportunities for training in anesthesia with the creation of rotations with UF Heath Shands Hospital at the University of Florida. We offer sub-specialty training through seven fellowships. Our ACGME-accredited programs include: Critical Care Medicine, Multidisciplinary Pain Medicine, Adult Cardiothoracic Anesthesia, and Pediatric Anesthesia. In addition, we offer non-accredited programs in Acute Pain Medicine and Neuroanesthesia. Our non-accredited, two-year Combined Adult Cardiothoracic and Critical Care Medicine Program is ABA-approved and prepares fellows to manage complex cases in a multidisciplinary environment. We can also tailor individualized non-accredited fellowships for trainees with specific interests. Each program blends clinical experience, didactics, and research to train the next generation of anesthesiology sub-specialists. The programs emphasize the ability to analyze and manage clinical problems by using state-of the-art technology and by leading teams of highly trained staff under the guidance of renowned clinical faculty.